Patriot Gold Corp., a gold resource and exploration company, today provided an update on the development of its 100% owned Moss Gold-Silver property near Bullhead City, Arizona. Following nearly eight years of exploratory drilling and analysis by the Moss Gold-Silver project teams, the Company announces that project development programs have been launched to potentially advance toward commercial development of the site during 2014. 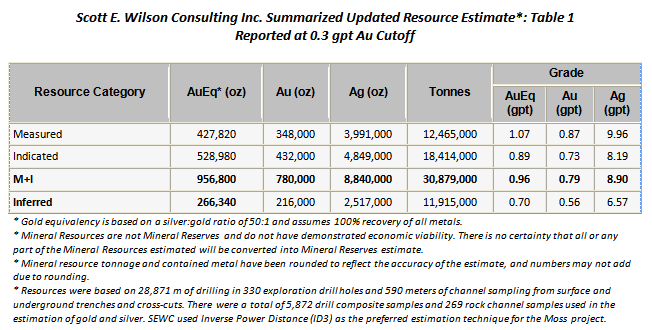 An updated independent NI 43-101 report completed in late 2012 indicated mineral resource estimate of 956,800 AuEq ounces (measured and indicated gold equivalent ounces) and 266,340 AuEq ounces (inferred). 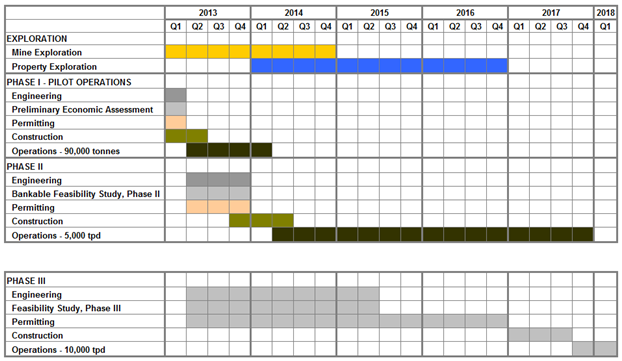 Continued mine exploration and Phase I pilot operations are already underway with construction slated to begin by the end of March 2013 and preliminary operations estimated to begin during the June quarter of 2013. At the same time, pending the results of a feasibility study, the company expects Phases II and III of the three-phased mine development plan to begin during the June quarter of 2013 with commercial development targeted to begin by the June quarter of 2014. The "parallel tracking" concept, whereby stages of development occur in parallel without waiting for the completion of one stage prior to the start of another, will be utilized to shorten the overall development time. The Moss project is to be developed in two parallel paths, Phase I and Phase II. Phase I will focus on continued exploration and mine planning including an on-site pilot plant that will provide technical information for the implementation of Phase II commercial development. 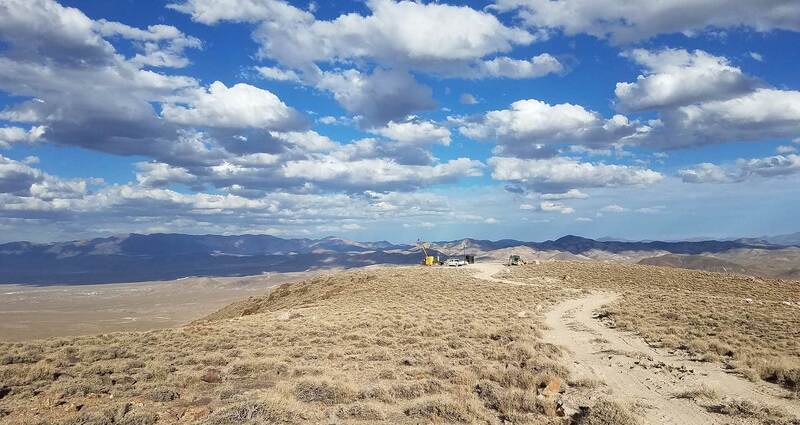 "As we begin a new year, I am very pleased with the progress that has been made in the development of the Moss Gold-Silver project," said Bob Coale, CEO of Patriot Gold. "More importantly, the detailed plan that is now in place gives our stakeholders a solid understanding of how thorough and systematic the parallel tracking approach is in capturing all the necessary steps needed in order to reach our long term objective of potentially ramping towards commercial production at the Moss site." Development work is being conducted by its earn-in optionee/operator. Three-Phase Mine Development Plan. A three-phase mine development plan, designed to move the project forward from conceptual design and laboratory test work to on-site pilot plant testing (Phase I) and then commercial operations (Phase II) is moving forward. As previously announced, this phased development approach with commercial production commencing at 5,000 tonnes per day (tpd) in an open pit, heap leach operation in Phase II, allows for a low initial capital expenditures and shorter lead times in reaching these production levels. The natural attributes of the Moss deposit can be capitalized upon, hereby reducing development risk and capital risk. As a feasibility study has yet to be completed, there is no certainty the proposed operation will be economically viable. The proposed schedule for the three phases is presented below. Continued Mine Exploration Program and Resource Definition Drilling. Two exploration programs are scheduled to run concurrently with the Phased Mine Development Plan: the Mine Exploration Program and the Property Exploration Program. As part of the Mine Exploration Program, extensive resource definition drilling is planned to continue in the area surrounding the Phase I and Phase II open pit, where the gold stock-work vein system outcrops at surface. Several targets adjacent to the initial open pit will also be explored as part of this program. Drill results, expected over the next few months and throughout the next two years, will be utilized to further define the known mineralization, to streamline the mine design for Phase II, and to expand the resource adjacent to the mine area. The current NI 43-101 mineral resource estimate is 956,800 AuEq ounces (measured and indicated) and 266,340 AuEq ounces (inferred). An independent technical report dated October 25, 2012, was completed by Mr. Scott E. Wilson, C.P.G. of Scott E. Wilson Consulting Inc. and independent qualified resource evaluators; this estimate has an effective date of September 10, 2012, and complies with National Instrument 43-101 for the Standard of Disclosure for Mineral Projects as adopted by the Canadian Securities Regulators. A copy of the full report is available on the Company's website at: www.patriotgoldcorp.com/NI43-101TechReport.pdf. Preliminary Economic Assessment. CDM Smith Engineering of Arizona, Project Engineers for the Moss Project, is on target to complete the Preliminary Economic Assessment (PEA) by the end of March 2013. This economic assessment, focused on both Phase I and Phase II, will address expected cash flows, operating costs and capital costs as well as mine and processing designs and other related aspects of mine design and operation. Pending the outcome of the PEA, a feasibility study will be initiated focusing on Phase II, with a target production rate of 5,000 tpd. Metallurgical Test Work. Additional metallurgical test work is currently underway at McClelland Laboratories, Inc. located in Sparks, Nevada. McClelland is a specialist in gold heap leaching operations. This additional testing is designed to improve upon results from the initial analysis of bottle roll and column leach test work analysis as reported earlier in order to optimize the balance of crush size, solution consumption, and leach times vs. metallurgical recovery rates. Exploring high pressure roll crushers and agglomeration variables as a means to liberate metal values which can then be recovered through traditional heap leach technology is also being conducted, as this could lead to higher recovery rates. These results will form a key component of the Preliminary Economic Assessment and will be further tested through the Phase I Pilot Plant operations phase. Engineering, Procurement and Construction Management (EPCM) for Phase I Pilot Plant. CDM Smith Engineering (CDM) has been retained to assist with the Engineering, Procurement and Construction Management of the Phase I development plan. Engineering for Phase I is anticipated to move from a 30% completion rate to a 60% completion rate prior the anticipated release of the Preliminary Economic Assessment at the end of March. This work is being carried out in parallel with completion of the PEA and is intended to substantially advance the engineering progress of the mine design, mine infrastructure and heap leach design in a parallel track, thereby enabling the advancement of the production timeline of Phase I. Construction Commencement for Phase I Pilot Plant. Also being "parallel tracked" prior to the release of the PEA is the procurement of certain long lead time items such as the pumps used throughout the leach circuit process, the agglomeration drum for mixing crushed ore with agglomeration materials and a five-column carbon absorption unit used in the gold extraction process. In addition to equipment procurement, official bid packages are currently being distributed for competent mining contractors specifically for the Phase I Pilot Plant but also for Phase II, where production levels of 5,000 tpd are targeted. Depending on the competitiveness of these bids, the mine will be either contractor- or owner-operated. With equipment procured and mining contractors secured, construction on Phase I could commence at the end of Q1 or early in Q2 of this year, once all necessary permits are received and the Project has been approved. Permitting for Phase I Pilot Plant. All the necessary authorities needed in order to secure the permits required to proceed with the Phase I Pilot Plant have been contacted and are in close cooperation. The Arizona Department of Environmental Quality (ADEQ) has advised that the Substantive Review is now in progress for Phase I Aquifer Protection Permit. Final permit authorization is expected to be received in Q1 2013. The Air Quality Permit Determination Request for Phase 1 is also currently being reviewed by ADEQ. Permit applications for Phase II will be pursued in due course should the PEA indicate Phase II is an economically viable option. Patriot Gold is the 100% owner in the historic Moss Gold-Silver property located in Mohave County, Arizona, which is subject to certain royalties and an earn-in option agreement for 70% interest. The earn-in optionee/operator has the right to earn a 70% interest in the project by completing an $8.5 million investment and a bankable feasibility study. Subsequent to the optionee/operator earn-in, financing of the project will be on a proportional basis.